We are proud to announce our role as the presenting partner of the first PDGA Major in the Southern Hemisphere - The 2015 Aussie Open. Over the past couple of years we've been working closely with the Aussie Open Event Organiser Chris Finn and his team, focusing on supporting the growth of Disc Golf on the Australian continent. This work has payed off in growing numbers of players around the vast nation. One of the key features in providing foothold for growth has been the establishment of DiscGolfPark Australia, the Aussie arm of our DiscGolfPark course design concept that has proven very successful in Europe. "The sport of Disc Golf has actually been played in Australia since the late 1970's. It was very popular for a number of years, although its development plateaued during the early nineties. However in the past few years, the sport has been gaining big momentum”, says Discmania CEO Jussi Meresmaa. "With the successful course design concept, solid equipment distribution model and big show events like the Aussie Open, it's easy to see a bright future for the sport down under", Meresmaa continues. Discmania is known for being been a big supporter of some of the biggest events in Disc Golf, including the European Open, European Masters and even the USDGC, but so far we have not been the presenting sponsor of a PDGA Major. "Having participated to the Aussie Open twice in the previous years, I see great potential in this tournament and with 2015 marking the year of the first PDGA Major in the Southern Hemisphere, it's a great time for Discmania to step up to the role of presenting partner for an event of this caliber", Meresmaa concludes. As it goes with just about everything we do, focus to the details has played a key role in the preparations of this event. 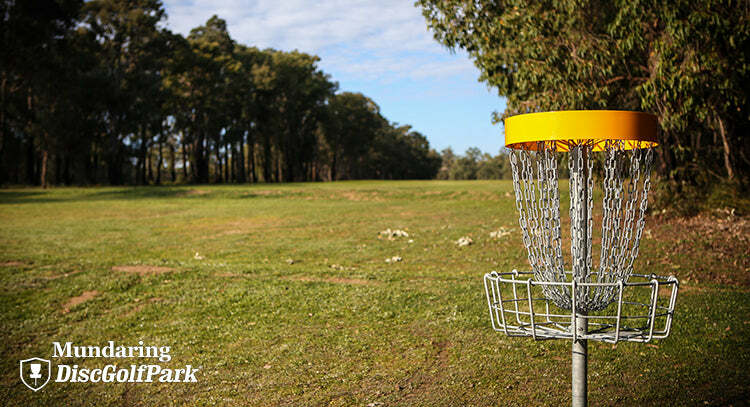 The Aussie Open will be played on the beautiful Mundaring DiscGolfPark just outside Perth, Western Australia. The original layout was created by course designers Chris Finn & Chris Himing, with Jussi visiting the site in 2014 to add his insight to the course design. "A Major layout needs to stand out and challenge the players with all different kinds of shots", says Jussi, who has designed tenfolds of courses in Finland and beyond. The European Open course, nicknamed the Beast, is a fine example for Jussi's design and it has been recognised as one of the favourites of the top players in the Disc Golf world. With Discmania being the presenting partner of the 2015 Aussie Open, our support in the form of fundraiser discs comes natural. The first fundraiser in the series is the new Discmania CD2, a "tweener" -speed disc that can be found useful by a wide variety of players. We were able reach the busy Event Organiser of the Aussie Open 2015, Chris Finn, for an interview about the upcoming tournament. Chris is currently in Rock Hill, South Carolina at the United States Disc Golf Championship where he is carrying the role of the sole Australian player attending the last PDGA Major of the year. Pictured: Aussie Open 2015 Event Organiser Chris Finn & European Masters TD Tommy Bessner heading to a practise round at Winthrop Gold. 1) Congrats on hosting the first ever PDGA Major on the Southern Hemisphere! For your local Disc Golf community, what is the significance of having a tournament of this caliber on your "backyard"? Disc Golf in Australia has been on the rise since 2007, when the Australian Disc Golf Association commenced a tour consisting of 7 events culminating in the Australian Disc Golf Championships. The Aussie Open is a real success in showing the Disc Golfers down this end of the world what the calibre of play is like in the northern hemisphere. This event will showcase some of the best players in the world and this sort of exposure to the local player base will go a long way to help develop the sport whilst also sharing our country with the world. 2) What can we expect from the 2015 Aussie Open? Are there certain areas you've specifically put attention to, comparing to other big international events? Having competed in multiple overseas Major tournaments I got a feel for what it was like to enjoy Disc Golf as a travelling player, both for the tournament sake and the cultural side. We have concentrated heavily on these areas. First of all we have designed a course that will challenge the best, whilst still being enjoyable to the average punter. We have also put together a taste of Australian culture, through introductions to the indigenous community with cultural shows and organised tours after the final day of play. We are also lucky that Australia Day falls on the Tuesday before the tournament and in Perth we have one of the biggest fireworks displays over the Swan River foreshore where the government spends a few million dollars to put on a big show, we have organised a bus to take all competitors down to enjoy the festivities with about half a million Australians. All travelling players will get to enjoy what we've got planned, we really wanted to inject a sense of Australia. What most people around the world wouldn’t know is that Frisbee sports have been in Australia at the least since 1976, the first Disc Golf course was constructed in 1978 in Victoria on the east coast, and this history is something we will also treat our guests to, ensuring they get a sense of where it all began down here. We will be sharing this story through the fundraiser discs and at the opening and closing ceremonies we will be showcasing some video and photos of this story. I think its really important that we get to share some of this story in a fun way through the fundraiser discs and the DUDE brand of clothing. Kids in the future will get to know the story without even thinking about it. You will want to collect this story, as it features guys like Dan Roddick, John Kirkland, Mark Horn - all stewards of Frisbee sports in the USA and around the world. 3) The final course design was made by Discmania CEO Jussi Meresmaa, with help from some of the most experienced local designers. What do you think is the significance of having a seasoned course design veteran doing the Major layout design for the event? The course design was done by DiscGolfPark Australia first in 2013, and further developed over the next 12 months, to where it stands today. Jussi came down to Australia in April this year and we worked hard together on tightening the layout, a permanent major layout was the plan we had in mind, but one which still allow good times for complete beginners. The course currently has both the gold and white tees, with some short loops for complete beginners. It was a big challenge to design a challenging course which allows for all levels of play, having Jussi ‘s advice and assistance in this process was invaluable. Mundaring DiscgolfPark will surely be a destination for Disc Golfers for years to come. Having a permanent Major course layout will surely help develop Australian players for the future. 4) Who do you think has the best chance of winning this event? Does the course design fit well with a certain type of playing style, or is it equally challenging for players with different styles? I would say this course will suit players with a great mental game, they will need to develop their plan on when to go for it, and when to play it safe. It will suit those that can throw at least 100m accurately, but the elevation changes will ensure those players are kept honest with the ob lines catching out the weary players. There is a mix of technical holes, open holes with elevation, a few creek hazards and not to miss holes through Aussie Bush. 5) Give us a sales pitch - From a player's perspective, why is this the event you just can't afford to miss? If you love disc golf and you want to escape winter to the land down under, then we just gave the world a reason to do it. Australia is a beautiful country and what a fantastic excuse to bring the family and friends on a Disc Golf Adventure to the other side of the world. Come and experience the extraordinary, be the first to win the first Major in the Southern Hemisphere! Dude Clothing and Discmania are really putting on a great experience for all players, you will be kicking yourself if you miss this one. 6) USA has naturally always been the hot bed for our sport, but lately Europe has been catching up fast. Will Australia be the next big Disc Golf destination? Give us an overlook on what's happening in the Aussie Disc golf scene. The Aussie Disc Golf scene is fantastic, it’s a big family from coast to coast. Australia doesn’t experience the low temperatures that the northern hemisphere does so Disc Golf can be played year round. The australians love their sports, so we're confident that in the next few years, the growth of Disc Golf will be exponential in Australia. There are a lot of great people around Australia working hard on growing the sports at grass roots levels, I like to call them the pioneers. Although Disc Golf was already played back the in 70’s in Australia, it really has been recent times that the sport of Disc Golf has gained its biggest momentum. The tour in Australia is really helping to generate growth of the competitive side of things and this has really been the focal point of the growth, spear headed by volunteer groups and also driven a long by the local retailers. 7) We know organizing PDGA Majors can be a lot of work. Anybody you'd like to thank at this point for making the dream of an event like this possible? I really have to thank my wife first and foremost, as I'm sure most people realise behind every hard working individual, there's an equally hard working supportive partner. She has weathered the storm of many things in the last few years but she understands that I only eat into family time when it comes to disc golf, everything else takes a back seat. It’s also really important to thank Jussi, I have been working hard with Jussi to help drive the development of the sport in Australia through course installation and disc sales at reasonable prices and Jussi has been a great support since met him in Taiwan in 2011. I would also like to thank Innova, they have been a great supporter of local events in Australia ever since I first got involved in 2008 and most likely before that as well. I also must thank the PDGA for entrusting me to put together an event of this size and calibre for the Australasian player group, I think this end of the world will greatly benefit from having this tournament. They have been supportive towards the Australian Disc Golf scene in many ways and we hope that this support is repaid over the next many years. Thanks for the interview Chris! We sure are looking forward to this event! The registration for the Aussie Open 2015 is now open. Register now for a Disc Golf adventure of a lifetime!